Michael Evans began his musical instruction at age 9 on trumpet at Holy Redeemer Catholic School (DC). He is a 2002 graduate of DeMatha Catholic HS in Hyattsville, MD and continued his education at Old Dominion University in Norfolk, VA earning his Bachelor's of Music in 2008. His primary teachers include Dr. Mike Hall, Mr. Dean Englert, MSG Scott Cameron (US Army Field Band), and MSgt Aaron Moats (US Air Force Band). 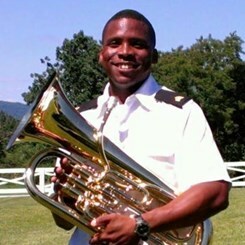 He is currently a member of the 380th Army Band in Richmond, VA. He is a member of the Concert/Ceremonial Band, Brass Quintet, Rock Band, Dixie Band, and Jazz Ensemble. His duties include principal euphonium player, trombone player, Supply NCO, and unit driver. Michael is the music teacher at Manassas Christian School and performs with several civilian musical organizations. He is the Associate Conductor, tubist, and trombonist with The Alexandria Citizen's Band and principal tubist of the Arlington Concert Orchestra. He enjoys spending time with family and friends, cycling, running, bowling, golfing, and attending orchestra and jazz concerts. Request Lessons with Michael Evans today!